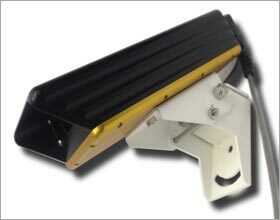 The Mobile IceSight is a remote mobile sensor that provides real-time surface condition and atmospheric information from a moving vehicle. It uses infrared technology to detect hazardous surface conditions without embedding any sensors in the pavement. The compact and rugged design can withstand the harsh environments of winter maintenance vehicles making it ideal for fleet management. The sensor’s open-architecture data output includes air temperature, relative humidity, surface temperature, six distinct surface indications and a surface friction coefficient. Data is provided to the user via a web based display compatible with any standard web browser on a computer or smart device. In addition, a java applet is provided for sensor auto calibration and data logging. When coupled with the Mobile Processing Unit and Glance subscription, the Mobile IceSight provides an AVL solution with a comprehensive data display and management tool.